Former Bosnian Serb president Biljana Plavsic, convicted of war crimes, is to be freed from her Swedish prison cell several years early. Plavsic, 79, turned herself in in 2001 and has served two-thirds of her 11-year sentence. The president of The Hague tribunal cited good behaviour and "substantial evidence of rehabilitation". But victims of the wars in Bosnia and Croatia complained that "the criminals have more rights than the victims". "How is it possible that Plavsic has the right to freedom and I do not have the right to find and bury bones of my son 14 years after he has been brutally killed?" asked Munira Subasic, head the Mothers of Srebrenica group. The Srebrenica massacre in 1995, in which around 8,000 unarmed Bosniak (Bosnian Muslim) men and boys were killed by Bosnian Serb forces, has been described as the worst atrocity in Europe since World War II. 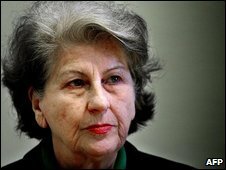 Plavsic, a hardline nationalist known as Bosnia's "Iron Lady", was convicted in 2003 after pleading guilty to war crimes including promoting a policy of ethnic cleansing of non-Serbs. She is the highest-ranking Bosnian Serb to admit responsibility for the atrocities of the 1990s Balkan wars. Tribunal president Patrick Robinson said Plavsic "appears to have demonstrated substantial evidence of rehabilitation" and had "exhibited good behaviour" in prison. "She has participated in the institution's walks and she also occupies herself by cooking and baking." In prison Plavsic wrote a book describing the events that led up to the Bosnian war. In the book, I Testify, published in 2005, she called on top Bosnian Serb fugitives Radovan Karadzic and General Ratko Mladic to surrender to the UN court in The Hague. She described Mr Karadzic as a "coward", but Gen Mladic as a "great man" who "should defend the Serb people and his soldiers before The Hague tribunal even at the cost of sacrificing himself". Mr Karadzic was captured in July 2008, but Gen Mladic remains on the run.